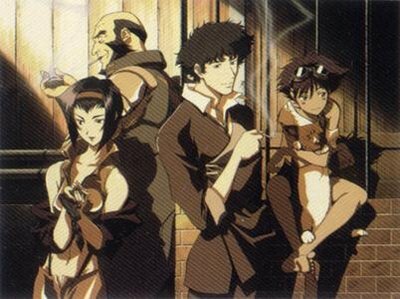 The crew of the Bebop. Cowboy Bebop is an anime that is comprised of primarily stand-alone episodes that follow the adventures of a group of bounty hunters. It is set circa 2071 where space travel is a norm and people might have a second home on Mars. 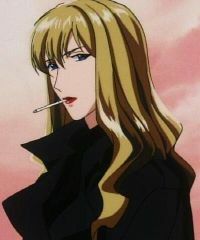 The over-arching plot centers around the main character, a bounty hunter named Spike Spiegel– which means mirror in German, a crime boss named Vicious and the woman that they fight over, Julia. 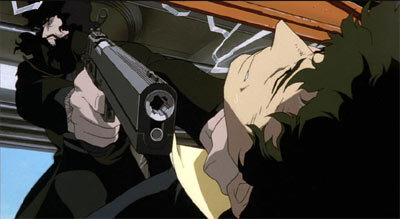 Spike Spiegel: I’m not a criminal. Oh that makes me seem even more like a criminal, doesn’t it? Spike is the surly, but well-intentioned protagonist. Over the course of the series, a brief 26 episodes, he gains and loses countless amounts of woolong (their currency), encounters an ex-cop turned bounty hunter, a woman with no past, a kid hacker and a genetically altered corgi. Spike is fairly ruthless when it comes to his bounties. He and his crew are well-known for accidentally getting their bounties killed before they can turn them in. 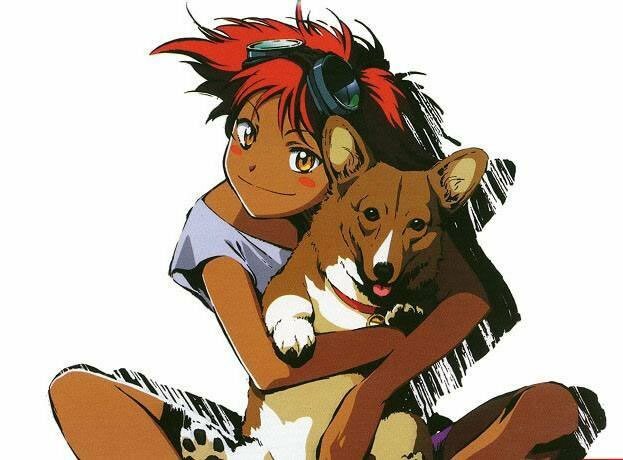 The whole series is motivated by his crew’s need for money to continue running their ship, the Bebop. 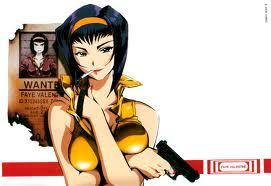 Faye Valentine: Survival of the fittest is the law of nature. We decieve or we are decieved. Thus, we flourish or perish. Nothing good ever happened to me when I trusted others. That is the lesson. Faye Valentine is the crew’s resident Femme Fatale. She gets her own plot line for a few episodes to explain her origins which up until that point are just as much of a mystery to her as they are to the audience. Throughout the series, she presents a sort of competition for Spike as far as talent as a bounty hunter goes. She is capable of charm that is difficult for most of the men in the series to resist, but can also switch it off in the blink of an eye if it isn’t working to her advantage. The sexually charged banter between her and Spike is laced throughout the series in a way that is fairly consistent with what we’ve seen in noir. Faye proves herself to be just as capable as any of the boys and frequently gets away with more than they do, much to Spike’s chagrin. She serves as a major vehicle of exposition as she joins the crew after the show’s opening. Another femme fatale in the series is Spike’s ex-lover, Julia. She causes more trouble throughout the series than any other character and she only actually appears in one episode. She is the reason that Spike fights and the reason he does not accept Faye’s advances. Before seeing the back story between Spike and Julia, one might be tempted to peg her as the naive, virginal character, but she is far from it. She is most often pictured in a black leather body suit, black trench coat and black sunglasses. She is a dangerous woman in her own right, though she puts far less effort into her sexuality than Faye. Jet Black: Everything has a beginning and an end. Life is just a cycle of starts and stops. There are ends we don’t desire, but they’re inevitable, we have to face them. It’s what being human is all about. Ed: Smoke smoke, Faye Faye. Puff puff, Faye Faye. If the show has a virginal, naive character it is Edward Wong Hau Pepelu Tivrusky the 4th (a name she made up for herself). She is the crew’s resident hacker and is primarily there to provide comic relief along with her companion, Ein. She is the crew’s youngest member at the age of 13. Vicious: Angels that are forced from heaven have to become demons. Isn’t that right, Spike? 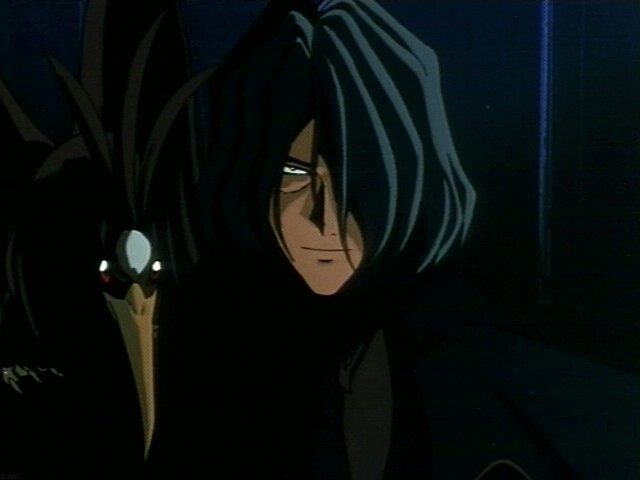 The aptly named, Vicious, is the primary antagonist of the series and is always shown in darkness. He is the head of a crime syndicate that Jet fought against when he was a cop. He is also shown through flashbacks to be Spike’s old war buddy. He is also shown to be the man that Julia left Spike for. His rivalry with Spike is what drives him and he on many occasions makes it known that he will do whatever it takes to see Spike dead, even if it ends his own life. Vicious, like Julia, only appears in a couple of episodes even though he is one of the main driving forces behind the plot of whole series. This show doesn’t just have noir characters. It is full of canted angle shots and gratuitous shadows. The canted angles and darkness are ever-present in Cowboy Bebop. They are something that the average audience member wouldn’t notice; I for one only noticed while rewatching sections of this show in preparation for this blog post. The cinematography was clearly influenced by noir and because the show is animated, they can create shadows and angles that they may not have been able to in a live action noir film. Vicious: So you are finally awake. I told you before, Spike… that I am the only one who can kill you. Spike: I’ll return those words back to you, Vicious. 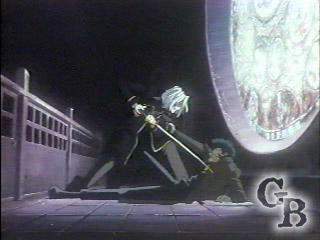 The show’s ending sequence where Spike and Vicious show down after 26 episodes worth of cat and mouse is very reminiscent of the overall theme of most noir. There is no happy ending for this anime. Over the course of the final episodes, the crew disbands and Spike goes off to seek Vicious one last time, this time knowing exactly where to find him. By the time Spike reaches Vicious, he has lost humanity. Julia is dead, but the two men must still settle their debts. The audience looks on in horror as the two settle it the only way they know how as soldiers, crime bosses and bounty hunters: with death. Its been a very long time since I first watched this show, but I definitely think you draw some great conclusions here about the noir links. The ending in particular I remember being quite hopeless and as such very noir. Stylistically I remember it having some smokey, dimly lit city-scapes ala Bladerunner, as well as an overall darkness to its lighting (if that makes any sense). Also I remember the humor as being at times quite risque and yet endearing in many ways. Overall I would say you make some excellent points about how the series fits into the noir landscape we have been venturing through. My only question would be if you think narrative wise the show lends itself more towards noir based on its crazy Japanese nature, or if its hard boiled detective vibe is what screamed noir more to you. Great post Maddy!!! This is great! Definitely noir qualities. I love that the protagonist’s name is Mirror. It reminds me of mirror placements of rooms of film noir and noir’s mise-en-scene mentioned in Place and Peterson’s article. Place and Peterson say that it’s symbolism is a representation of fragmented ego, idealized image, and possible foreboding qualities “because they are so compositionally prominent” (p. 68). I have never seem this series, so I’m not sure if this is true. Have you notice anything like what Place an Peterson have described? Great point, Ashley. I’m not sure mirrors have featured as prominently in the films we watched this semester as Place and Peterson suggest, but there are some great ones: check out The Lady from Shanghai for it’s amazing funhouse mirror climax. I really like the analysis you have made on the show, being a fan i feel your have pointed out some very interesting themes about both the protagonist and about the femme fatale in Julia’s case. I also recall many of the episodes including themes of corruption in the police department, a good example of this is in episode 16 “Black Dog Serenade”, which also features a number of flash backs to show a life changing moment in Jets past which resulted in a great loss. After reading this article and all I have read from others before me I feel that I have no problem considering this series Noir. 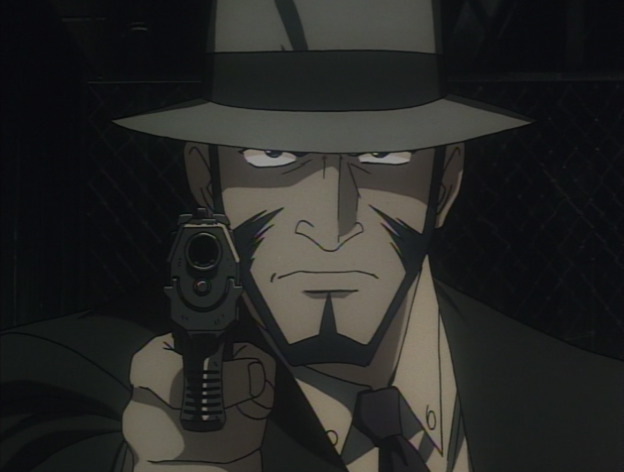 I do however have a question about the anime characteristic in general, with traditional Noir films following a more realistic interpretation of things do you think the series being made into an anime series takes away from the overall Noir essence or do you feel that the Noir elements are present in a large enough caliber that it doesn’t really matter either way?